The best way to connect your social media profiles to your WordPress website is by adding social media icons to your sidebar. In this article, I will show you how to add social media icons to WordPress. There are hundreds of social media plugins available in the WordPress repository. We will be using the Simple Social Icons plugin. Mainly because it is simple and makes it super easy to add social icons to any widget ready area or sidebar on your WordPress site. First thing you need to do is install and activate the Simple Social Icons plugin (here is how to install a WordPress plugin). Next, go to your widget page. This is located under Appearance in your WordPress admin menu. Simple Social Icons will be listed with your other available widgets so you just need to drag the widget to your preferred widget zone (e.g. your theme sidebar). Most WordPress plugins are configured via a general settings page. Simple Social Icons handles things differently by placing all configuration options in the widget itself. Instead of choosing from predefined icon sizes, you can define the exact size of your social media icons; whether it be 10 pixels or 150 pixels. Icons can be aligned to the left, center or right. The background and text colors can be changed. You can also change the color of the icons when a user hovers over an icon. 12 major social media websites are supported including Twitter, Facebook, Google+, LinkedIn and StumbleUpon. An email and RSS icon is available too. Simply paste the URLs of your social network profiles. 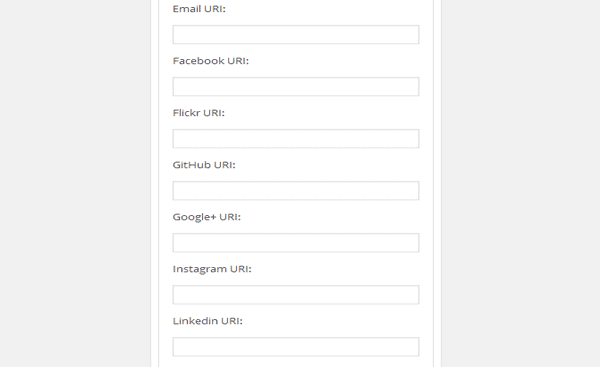 Leave URI field blank for social networks that you don’t want to display. The final output looks great. Remember you can adjust the size and colors of icon to match your sidebar’s width and colors. I hope this article helped you add social media icons to your WordPress blog. If you liked this article, then join ThemeLab on Google+ and Twitter. Hey Noumann, thanks for the advice, I use Simple Social Icons now and I like them very much. Any advice on what plugin to use to display a “share on twitter” or “share on facebook” button above and/or below a post, similar to what you have under the title of this article? Take a look at Floating Social Bar. It allows you to add social sharing buttons on top of your articles. We use a modified version of floating social bar on ThemeLab. Awesome, thanks Noumaan, just what I needed.